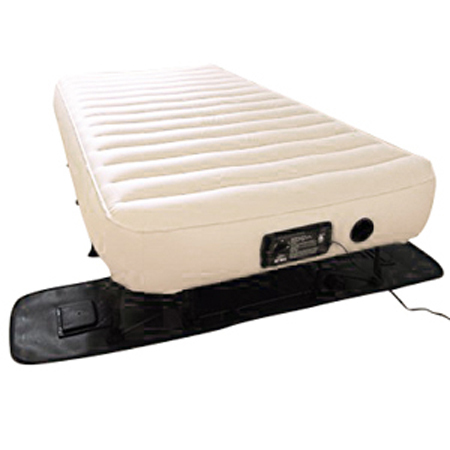 Here, we use the term “air mattress” loosely because we also review and rate sleeping pads and other products from the family of “inflatables”. The goal is simple, to find the best one sin each of these categories of air mattresses. To be more specific, in each category that we research and test we list the TOP 3 products (hence the 3beds.com). To put it differently – we are doing the research on air mattresses, so you don’t have to. And it goes beyond that, because with all the moving parts in today’s market, it has become increasingly difficult for a person to tell true quality from empty marketing statements. That’s where we come in: we objectively test, review rate and list the best in each category. Before you read about core team members, we just want to mention that the short bios of every person are written by the other members of the team. We take the work we do very seriously, but we like to keep the process light and fun (just to give you a perspective of the things you are about to read). James spent most of his life in pursuit of adventure. Most of the adventure involved the great outdoors, hiking and camping. With that in mind it’s safe to say that if anybody knows air mattresses, it’s him. The joke around the office is that it’s because he was around when the first one was invented (one of the few jokes he doesn’t like to hear). But, in all seriousness, he probably spent more hours sleeping on air mattresses and sleeping pads than most of our team has on regular beds. He is the founder of 3beds.com and the person responsible for bringing the team together and initially shaping the concept of tests and reviews of air mattresses. James is an established writer and contributor to a number of reputable magazines and online publications (like TGO Magazine, Klymit, Real Camping, The Next Challenge, Naimakka, Elephant Journal, Planet D, Eno). He founded 3beds.com and a few other gear testing sites to share the knowledge he has accumulated over the decades. Most importantly, he has the face that you can’t get mad and two misaligned vertebrae at and that allows him to get away with a lot of stuff. Things like forgetting where he’d put all the testing samples for the Coleman Quickbed from the last batch of air mattresses we tested (that’s right, we didn’t forget that one). We let Alex believe that he is second in command, which he kind of is but the way we run things is not is much about titles and who’s in charge (except for Alex). He’s the fuel in the tank of 3beds.com and without him, we would have too many days of binge-watching “Game of Thrones” in the office. That’s the reason we follow his lead and his intense energy when it comes to working hard and sticking to the schedule. The first reason, that is. The second is that we fear that, if it were any different, he would punch a wall and go throw rocks at bigger rocks for two full days. Kidding aside, we don’t even want to think about where 3beds.com would be without his go get’em temper and the ability to awaken the worker-bee-side in the rest of us. Nobody around here has the eye for detail Mel has. She’s passionate about adventure, about her reviews and the ones she edits but she’s also passionate about some stuff that the rest of us find (hm, how do we put this) – weird. One of those things is curling (as in curling the sport). Yes, you are reading it right. She is the calming presence of the office and makes the worst of days more bearable. We don’t always understand her but we do love her. When we talked about Nenad we forgot to say that he says one sentence a lot, he asks if he has to do everything around here. Most of the time he says it to Ryan. If you met Ryan, you would have a hard time believing that the guy with the nonchalant attitude hiked a majority of the most difficult trails in the North USA before he was 25. He seems more like a guy who eats a lot of peanut butter. Straight out of the jar. Using his fingers. His motto is, “Take it easy…” And he does, he takes things easy, sometimes more than we like to see, but he has this way about him that makes work fun. And we couldn’t take the workload without it. Everything changed when Oscar joined the team. He holds a degree in Materials Engineering Technology (2MATE) from PennState and the helps us part-time basis. The reviewing process of the air mattresses as we know it now would not have existed without him, as simple as that. Until Oscar joined us (it’s hard to admit it but it’s true), our reviews didn’t really stand out from a number of other review websites out there. There were much more empirical, subjective and lacking in real structure. Oscar brought in the science, shaped the procedures, proposed new things to be tested and included in the final ratings. It is because of him that we can, without being falsely humble, that there is no other website out there that approaches the subject of air mattress reviews. It’s Oscar we have to thank for that. We like the saying that a day without laughter is a day wasted and like to introduce humor into our every-day operation. We’re sure you agree that it’s only fair that you get a glimpse of the people behind the faces that you are taking advice from. That in no ways changes the fact that we take what we do very seriously and that we are aware of the responsibility that comes with recommending products to people. We work diligently, we tweak the review process over time and we believe we deliver only objective, fresh and reliable information.